It’s easy to see the political advantage for Republicans in opening a select committee to investigate the matter. 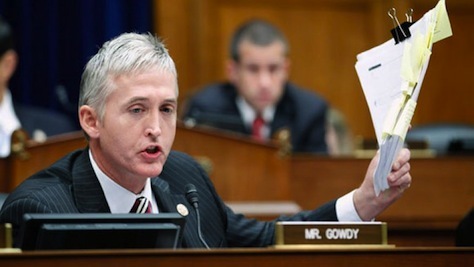 Trey Gowdy (pictured above), the two-term congressman from South Carolina, who will head the committee, is already talking about the investigation in terms of a ‘trial,’ with Gowdy and his committee as the prosecution and the Obama administration as the defense. In such confrontational terms, the Benghazi flap helps motivate the Republican base in the upcoming November 2014 midterm elections, and if, as predicted, Republicans maintain control in the House, the newly formed Benghazi committee will probably run through the 2016 election, where it will certainly generate negative publicity for former US secretary of state Hillary Clinton, the wide frontrunner to become the Democratic Party’s 2016 presidential nominee and a slight frontrunner, accordingly to current polls, to become the first US female president. Them’s the rules, and that’s politics, sure. In divided government, where the non-presidential controls one or both branches of the US Congress, investigations are part of a health set of checks and balances. But it’s hard to believe that the Republican emphasis on Benghazi could come from a legislative caucus that takes real oversight seriously on foreign policy and constitutionality. That’s because it’s difficult to understand why there’s a great public need for a select committee on Benghazi. Boehner’s decision follows the release of new emails requested by Judicial Watch, including one that hadn’t previously been released to the House Committee on Oversight and Government Reform. Republicans have held up one email, in particular, from adviser Ben Rhodes, as a ‘smoking gun,’ reigniting the furor over Benghazi once again. But as Slate‘s David Weigel wrote about a week ago, it’s hardly a ‘smoking gun,’ because Rhodes’s talking points are largely based on the intelligence from the US State Department and the Central Intelligence Agency that, at the time, believed the attack on the Benghazi consulate sprang from protests over an anti-Muslim documentary. Though this turned out to be wrong, it wasn’t an unreasonable conclusion in the fog of the moment — there were protests on the very same day in Cairo for that reason, and I wrote here about those protests and the difficultly they presented to Egypt’s then-president Mohammed Morsi. If the CIA goofed, certainly it’s far less of an error than mistakingly determining that Iraq had weapons of mass destruction in 2002. No incumbent president wants an October surprise (or, in this case, a September surprise) right before an election, so it would have been political malpractice for Obama’s communications team not to try to convey that the administration’s policies hadn’t somehow suddenly failed. That, too, is politics, especially so close to a presidential election. As Clinton so memorably said in her testimony to the Senate Foreign Relations Committee, ‘what difference, at this point, does it make?’ Whether the attack in Libya resulted from a protest gone awry (as it didn’t) or from a more planned operation (as it did), the Obama administration was still been left with the underlying difficulty of explaining why it failed to protect the consulate. So it’s never been incredibly logical why the Obama administration would have wanted to ‘cover up’ the attack’s genesis. Either way, the Obama administration took a hit less than two months before the US general election on an issue (national security) that was previously a political strength for Obama. House insiders speculate that the decision to form a select committee is a way to sideline Darrell Issa, the head of the House oversight committee that had been previously hammering away at the Obama administration over Benghazi. That was true in 1974, during Republican president Richard Nixon’s administration, when an ambassador and his assistant were killed outside the embassy in Nicosia, Cyprus. It was true in 1979 during the Democratic presidency of Jimmy Carter when Islamists tried to burn down the US embassy in Islamabad, pakistan, killing two Americans. It was true in 1983 during Republican president Ronald Reagan’s administration, when a car bomb destroyed the US embassy in Beirut, Lebanon, killing 63 people altogether. It was also true in 1998, when on Democratic president Bill Clinton’s watch, al-Qaeda simultaneously bombed both US embassies in Nairobi, Kenya and Dar es Salaam, Tanzania, killing a total of 213 people. In each case, you can blame the US government, ipso facto, for failing to secure the respective embassies. That’s true for the attack on the Benghazi consulate as well, and Clinton, who was leading the State Department at the time, took full responsibility for the breach of security. It’s a particular shame that House Republicans have been so focused on Benghazi when there’s such a rich spectrum of strategic and constitutional fights that they could pick with the Obama administration that have much more merit. You could begin with the initial 2011 decision to provide US military assistance to the UN-sanctioned NATO mission to back Libya’s rebels by enforcing a no-fly zone. The Obama administration arguably violated the 1973 War Powers Resolution and the presidential obligation to notify the US Congress. The Obama administration at the time argued that the Libyan intervention didn’t rise to the level of full-blown ‘hostilities,’ but that’s hardly a definitive interpretation, especially from the Congressional point of view. A lengthy investigation into that decision could help reclaim a measure of constitutional clarity and, possibly, greater Congressional oversight in US military interventions abroad in the future. Three years on, it’s hard to justify the NATO intervention in Libya in strategic terms, either. I’ve argued that neither Democrats nor Republicans have yet to learn the real lessons of Benghazi, which concern broader US policy failures than the tragic security flaws that led to Stevens’s death. The US-backed rebels ultimately toppled Libya’s late strongman Muammar Gaddafi in the most extralegal manner imaginable (you can watch a vigilante mob execute him here). Libya today is an ungovernable mess, its last prime minister, Abdullah al-Thinni, resigned out of security fears, and its new prime minister, Ahmed Maetig, named this week, may not have been duly elected. Local militias largely form security throughout the country, and some local leaders in Libya’s eastern oil-rich region of Cyrenaica, angry over revenue-sharing and other slights, have disrupted oil flow in a bid to separate from the rest of Libya. That’s without noting the fallout in the rest of northern Africa and the Sahel region, where it’s believed that the influx of weapons and other military support for the anti-Gaddafi rebels found their way to Mali, catalyzing a long-simmering northern uprising, a military coup in response and a two-year civil war that drew international jihadis to Mali and derailed a country that was, for two decades, moving steadily toward democracy. After French intervention, Mali seems headed in the right direction. Even if you’re thrilled that Gaddafi is gone, what’s followed hardly seems much of an improvement — and the US government holds at least some responsibility for that. Even beyond Libya and its fallout, there’s a treasure of constitutionally questionable actions that a serious and robust opposition party would be investigating. Where’s the select committee on the surveillance and snooping by the National Security Agency and whether it constituted unconstitutional breaches of US rights? Where’s the select committee on the Obama administration’s drone policy, the controversial use of ‘signature strikes,’ and whether that’s helping or hindering anti-terror efforts in Pakistan, Yemen, Somalia and worldwide? Where’s the select committee to investigate the US assassination of a 16-year-old American citizen, Abdulrahman al-Awlaki, without any known probable cause — does the US president even have the right to assassinate US citizens in the first place? It’s not that the House and Senate foreign relations committees haven’t investigated these matters, especially regarding the NSA. But the focus among House Republicans has been disproportionately about Benghazi. The explanation is politics, and that focus comes at a cost of making better foreign policy. ‘Benghazi’ is so much more accessible as a scandal (attack! cover-up!) than intelligence reform, or the constitutionality of executive power or even the constitutionality of assassinating US citizens, or today’s strategic blunders that could cause tomorrow’s global problem areas. So Americans will spend the next two-and-a-half years of the Obama administration fighting over the politics of a non-scandal at the expense of debating more weighty matters.